CFS is committed to an education that values academic excellence and offers an outstanding and diversified curriculum that prepares students for higher education, career success and Christian living. CFS embraces technology and media to enrich the academic environment and prepare students to excel in an increasingly technology-rich world. CFS offers robust arts and music programs where students are encouraged to unleash their God-given creativity to impact culture and the world. CFS offers a comprehensive championship athletic program that promotes fitness, character-building, collaboration, work ethic and school pride. CFS cultivates student leadership development that builds confidence, promotes good decision-making, enhances communications skills and supports mentorship. CFS is a thriving faith-filled community that engages our culture developing leaders in the marketplace by providing focused character development and critical thinking skills based on the word of God. CFS Offers student-lead praise and worship at weekly Chapels, daily Bible classes, monthly community service, and Christian worldview integration in all subjects. CFS engages students in community outreach and national and international mission trips that provide opportunity for students to use their skills and talents in the service of God and others. CFS students are part of a mentoring team that enables them to teach, learn from and benefit each other to succeed academically, grow spiritually and develop as human beings. Everything we do at CFS is aimed at promoting smart life choices flowing from a personal relationship with Jesus. CFS is home to 500-600+ inspired students thriving in a culturally diverse environment of domestic and international students committed to stimulating our community with confident leaders. CFS is a school that enhances student success by ensuring a low student-teacher ratio, encouraging strong student-teacher relationships and cultivating a partnership between parents, faculty and staff in the education of each child. CFS is the first-choice for premier private education with affordable tuition attracting diverse families from various backgrounds to our state-of-the-art programs. CFS is able to meet the needs of all students along the full learning continuum, from those with learning challenges to academically gifted students who would benefit from advanced course work. CFS is a community that is family oriented, encourages parent engagement and social interaction and brings students, parents, faculty and staff, and other members of the CFS community closer together. CFS is a financially healthy and well-funded institution with a strong endowment and broad and committed donor base who support the advancement of our school. CFS encourages and cultivates parent leadership and involvement through a highly engaged and supportive parent organization. The Advancement Program at CFS consists of a marketing team and fundraising office that is committed to promoting and growing the school and building a robust fundraising program ensure our stability, sustainability and accessibility. 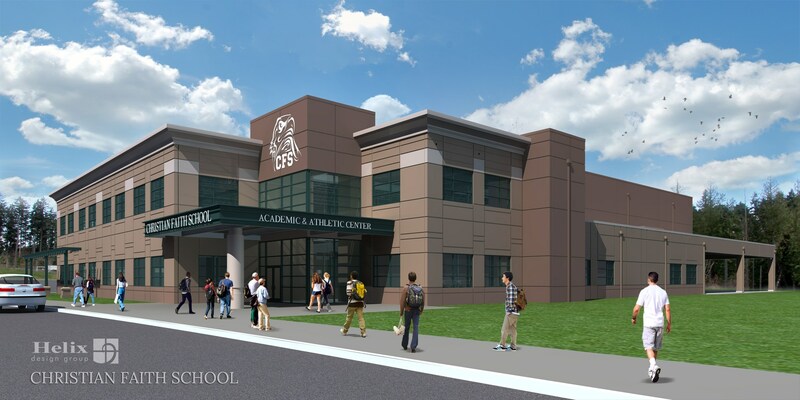 CFS offers an array of outstanding, purpose-built facilities to accommodate academic programs, athletic and physical education programs and a broad array of extra-curricular activities. CFS has the necessary facilities to support championship athletics that compete at the state level. CFS provides optimal facilities and equipment to support specialized programs, including the sciences, technology and multi-media, and art and music. CFS provides facilities that underpin our goals to attract new students and families and engage the broader community. CFS is creating a tournament ready gymnasium capable of hosting the most common size of tournaments for both volleyball and basketball with multiple games played at once on full size courts with seating for about 500 spectators. Christian Faith School has established a select number of commemorative naming opportunities related to our efforts to fund a new facility. By offering these opportunities, we hope to remember, in perpetuity, the sacrifices of our supporters, and inspire future generations to follow their examples of stewardship. Here at CFS we have been blessed with some amazing Alumni families, current families, businesses, and other individuals that have helped us raise over $2million dollars! To those who wish to remain anonymous.